If you or someone you know is suffering from blepharitis, you might be wondering: is blepharitis contagious? Before we get into that, let’s first discuss what exactly blepharitis is and what causes it. Are your eyelids inflamed, irritated, itchy, and red? Do you notice that crusty or dandruff-like particles accumulate on your eyelids and eyelashes overnight? You may be suffering from blepharitis, or inflammation of the eyelids. Blepharitis is the result of inflamed oil glands within the inner eyelid. Blepharitis can be caused by bacteria entering these oil glands, as well as poor hygiene surrounding the eye area. It is also common for blepharitis to accompany other allergic or bacterial skin conditions. The answer to “is blepharitis contagious?” is no, it is not. Unlike many other bacteria-related eye conditions, such as pink eye, blepharitis is not spread person-to-person. With blepharitis, you may experience inflammation in the membrane that covers your inner eyelid, as well as within the white of your eye. Blepharitis symptoms can be the result of an accumulation of harmful or infectious bacteria on the eyelids and around the eyes. It can also be caused by dandruff, oily skin, contact lenses, and makeup. Although this condition is not always curable, it can be treated through good hygiene practices and medicinal or natural methods. Keep reading to learn more about the causes, risks factors, and treatment options for blepharitis. We also share some of the best methods for preventing this common eye condition. If you experience inflamed, irritated, or crusty eyelids, then it is possible that you are suffering from a case of blepharitis. The term blepharitis refers to inflammation of the eyelids. 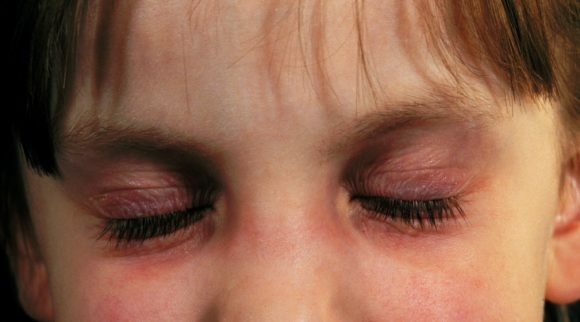 When dealing with this condition, your eyelids may become itchy, irritated, and red. Blepharitis can also cause particles that are similar to dandruff or crust to accumulate along the eyelash line. Blepharitis is a very common eye condition that can be caused by bacteria and/or existing skin conditions such as rosacea. 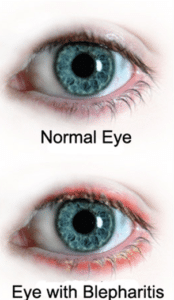 There are two main types of blepharitis. These types refer to the location of the inflammation. If you have anterior blepharitis, then the inflammation happens along the eyelash line, or the area where your eyelashes grow from your eyelids. This curable type of blepharitis is most commonly caused by either dandruff or a buildup bacteria, allergens, or mites within the eyelids. The other common form of blepharitis, posterior blepharitis, occurs within the eyelid’s inner edge where the eyelid comes in contact with your eyeball. This form of blepharitis is most commonly caused by blockage and inflammation within the oil glands within the eyelids. Unlike anterior blepharitis, posterior blepharitis is not curable. Luckily, if you have posterior blepharitis, then you will still be able to relieve your symptoms through certain treatment methods. Blepharitis can also lead to other skin and eye conditions including chalazia, styes, corneal ulceration, cysts, conjunctivitis (pink eye), and other issues involving dry eyes and the production of a healthy tear film. In many cases, blepharitis is misdiagnosed as conjunctivitis, which is commonly referred to as pink eye. Is blepharitis contagious? No. But pink eye, or conjunctivitis, is. It can also be mistaken for dry eye syndrome. Although the treatments for these conditions can be similar to the treatment options for blepharitis, they are largely focused on the inside of the eye rather than the eyelid, so it is important to know the differences in these conditions in order to best relieve your symptoms. Although anterior blepharitis and posterior blepharitis are the two main types of blepharitis, this condition can be further divided into different categories based on the root cause of your disorder. Understanding the different possible causes of blepharitis can help you to choose the best treatment and prevention methods for this condition. It is important to note that some of these forms of blepharitis can occur simultaneously. Infectious blepharitis, which is a sub-type of anterior blepharitis, refers to those cases that are caused by a bacterial infection, usually a staphylococcus infection, in the glands near the eyelid. This form of blepharitis is commonly caused and worsened by poor hygiene practices that allow for the spreading and accumulation of bacteria on the face and in the eye area. 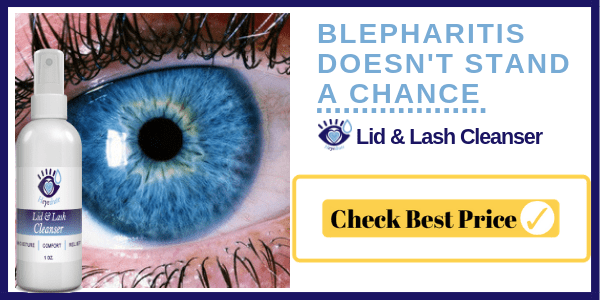 This form of blepharitis can be caused by the unsanitary handling of eye makeup, contact lenses, and other items that come in close proximity of the eyes. Seborrheic blepharitis is common in people who suffer from seborrhoeic dermatitis. This form of blepharitis occurs when the skin cells in the eye area begin to shed at a faster pace than normal. This can occur when a sebaceous gland in the eyelid area is not working properly. The sebaceous glands are important for supplying the skin with oil. These glands also assist with creating the oily, or lipid, layer of the tear film. If your oil glands are not producing enough oil, then you can develop dry eye syndrome, which can then lead to developing symptoms of blepharitis. On the other hand, if these glands produce too much oil, then the extra oil and skin cells provide an environment for bacteria to grow. Some eye care professionals believe that the yeast Malassezia furfur is the main trigger for seborrhoeic blepharitis. Contact dermatitis blepharitis is caused by an object contaminated with harmful allergens or bacteria coming into contact with the eyelid. This type of blepharitis is most commonly caused by the use of unsanitary makeup products or contact lenses. This type of blepharitis can be prevented by maintaining proper hygiene. You should regularly sanitize your makeup products, especially those that come with close proximity to your eyes. You should also be sure to clean your hands before applying contact lenses. Meibomian blepharitis, also referred to as meibomian gland dysfunction, occurs due to complications with the ability of the meibomian glands to properly produce oils. Each eyelid has around 25-30 meibomian glands which are located behind the eyelashes. These glands produce the oily component of the tear film which keeps the eyes moist and sufficiently lubricated. Complications with these glands can lead to inflammation of the eyelids and dry eye syndrome. If left untreated, this form of blepharitis can lead to the formation of meibomian cysts, which may require a surgical procedure for removal. Blepharitis is a very common eye condition that can be caused by bacteria and/or existing skin conditions. Some pre-existing skin conditions that can increase your risk of contracting blepharitis include rosacea and dandruff. The good news is that blepharitis is non-contagious and usually has mild effects. In most cases, blepharitis will not cause any lasting damage to your vision. There are many possible causes for the contraction of blepharitis. It is important to understand the root cause of your blepharitis, as well as which form you have, in order to pursue the most effective treatment options. One of the most common causes is the building up of infectious or otherwise harmful bacteria along the eyelash line. These bacteria lead to the formation of flakes in this area. This can also be caused by blocked or contaminated oil glands in this area of the face. Top Related Article: What is Blepharitis? The different forms of blepharitis can stem from different causes. If you are suffering from anterior blepharitis, then it is most likely the result of bacteria, particularly staphylococcal blepharitis. Another, less common cause for the contraction of anterior blepharitis is allergies, particularly in the form of a Demodex mite infestation of the eyelashes. It can also be caused by the development of dandruff on the scalp and in the eyebrows. Blepharitis that develops in this manner is also known as seborrheic blepharitis. The causes of posterior blepharitis differ from the causes of anterior blepharitis. Posterior blepharitis, the more common form, is more common in people who also suffer from skin conditions such as dandruff and rosacea. If you are dealing with posterior blepharitis, then it is most likely caused by an inflammation of your eyelid oil glands. If these oil glands become inflamed, then they cannot adequately produce oil, which leads to posterior blepharitis. The effect that posterior blepharitis has on oil production within the eye area can also affect proper tear film production. The production of oil for the tear film keeps your eyes moist and helps in preventing dry eye syndrome. The good news is that neither anterior or posterior blepharitis is contagious. However, if left untreated, it can lead to other problems that can affect the overall health of your eyes. This condition can cause redness, itchiness, and flakiness of the eyelids and cause or worsen symptoms of dry eye syndrome. Posterior and anterior blepharitis can also cause a yellowish crust-like material to build up along the eyelash line. Blepharitis symptoms usually affect the upper and lower lids of both eyes. The symptoms of blepharitis can be minor for many people. The most common symptoms of this conditions are itchiness and irritation around the eyelids. Some people experience the more severe effects of blepharitis which include blurry vision, the loss of eyelashes, and inflammation of the eye and cornea. Infections can also occur if a blepharitis sufferer continually touches or rubs the area. The flaky or crusty particles that come along with blepharitis are one of the most uncomfortable symptoms of this condition. The accumulation of these particles usually occurs throughout the night or during other periods of sleep. For some blepharitis sufferers, this build up can make it difficult to open your eyes upon waking. Improper treatment of blepharitis and its symptoms can increase the risk of infections in the oil glands that are present along the edges of your eyelids. Infections within this region can lead to the development of a stye that can become a chronic cyst. Chronic cysts sometimes require surgery in order to be removed. Your likelihood for contracting blepharitis is based on a few lifestyle and demographic factors. Blepharitis is a common condition that affects people who have oily skin, existing skin conditions, and dry eyes. Overall, poor hygiene is one of the biggest risk factors for contracting blepharitis. Individuals who do not properly wash their hands are more likely to contract blepharitis. Many of us commonly touch our faces and rub our eyes. If you do so with dirty hands, then you are transferring germs from your hands to your eyelids and eyes. This can increase your risk of developing blepharitis and other eye conditions. This condition is also very common among individuals who wear contact lenses. Improper usage of contact lenses can lead to many eye conditions. If you commonly handle your contact lenses without washing your hands, then you are putting yourself at risk for developing blepharitis. You can also increase your risk of blepharitis if you fail to remove your contact lenses nightly. You should remove your lenses as often as directed by your optometrist and store them in a clean case with fresh solution after each removal. Wearing eye makeup on a regular basis can also increase your risk of developing blepharitis. If you commonly apply makeup with contaminated utensils and unwashed hands, then you have a higher likelihood of contracting blepharitis and other eye conditions. You should always apply your eye makeup with clean applicators and avoid sharing liquid eye makeup products with others. You can also increase your risk of getting blepharitis if you are not be removing your eye makeup at the end of each day in order to prevent the buildup of germs and other foreign particles that can cause this condition. Prolonged periods of time spent using a computer can also increase your risk of contracting blepharitis. This is due to the fact that while on the computer, we tend to keep our eyes open for longer periods of time, which leads to eye dryness, a common cause of blepharitis. Blepharitis is also common in people who suffer from meibomianitis. 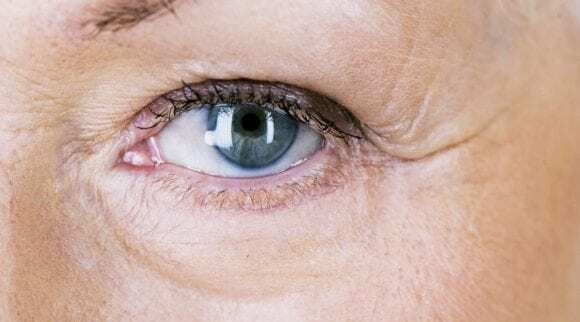 This condition is caused by recurring inflammation of the eyelid oil glands. 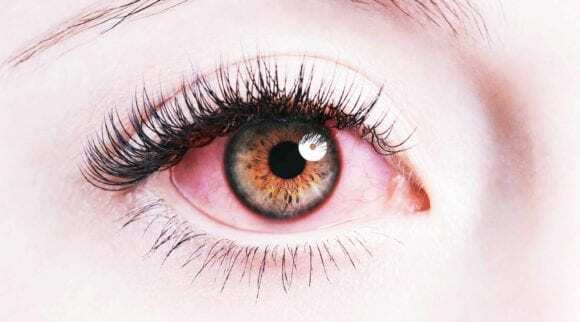 This can lead to chronic eye dryness as well as it affects the ability of these glands to produce an adequate amount of oil for a healthy layer of tear film. Although it can be easy to tell if you have blepharitis based on the presence of common symptoms, you should still schedule an appointment with your doctor or eye care specialist. A medical professional will be able to determine exactly which form of blepharitis you have contracted. This information is important for determining the best treatment options and prevention methods for your blepharitis symptoms. Your doctor or eye care specialist may need to know more information about your current symptoms and medical background in order to best determine the causes and best treatments for your particular case of blepharitis. During your appointment, your doctor or eye care specialist will perform a few tests and procedures in order to determine whether or not blepharitis is the best diagnosis for your symptoms. Your doctor will begin by performing an examination of your eyelids and eyes. They may use a magnifying tool in order to get a better look at your eyelids and eyes. They may also swab the area in order to gather a sample of the crust or oil within your eyelid. This can help your doctor or eye care professional to determine whether or not your case of blepharitis is caused by bacteria, mites, or allergens. In most cases, your healthcare specialist will not need to perform any special tests beyond a regular physical examination in order to diagnose you with blepharitis. However, if your inflammation looks worse than the typical case of blepharitis, or if your condition persists even with treatment and improved hygiene habits, then your doctor may want to perform a swab test of your eyelid. In some rare cases, certain cancers can have similar symptoms to chronic blepharitis. You may also have to undergo a biopsy if your blepharitis symptoms do not improve, in order to make sure that your condition is not the result of cancer. One of the first steps towards controlling blepharitis is to maintain good hygiene practices. You should wash your face and scalp on a consistent basis with a tea tree oil soap. It can also be helpful to regularly apply a warm compress over your eyelids in order to scrub them thoroughly and cleanse them. If you are currently suffering from a case of blepharitis, it is also a good idea to avoid wearing eye makeup and contact lenses as you undergo treatment. Although maintaining proper hygiene is a great first step towards treating and preventing both posterior and anterior blepharitis, there are different treatment options for alleviating the symptoms of both forms of blepharitis. For anterior blepharitis that is caused by a bacterial infection, you will most likely need to use some form of antibiotics in order to cure the condition. Your doctor or eye care specialist may prescribe an antibiotic treatment in the form of a pill, topical ointment, or antibiotic eye drops. The use of antibiotics can be a great help in fighting off the infection, and, in turn, will alleviate the accompanying blepharitis symptoms. 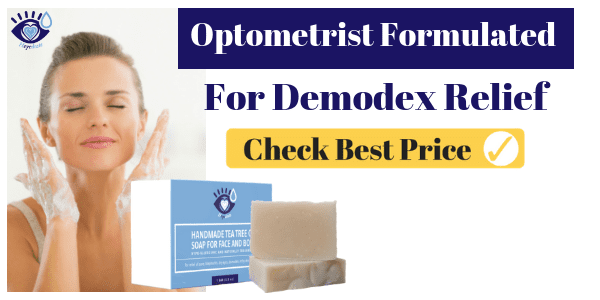 If you are prescribed an antibiotic ointment to treat your blepharitis, then you should be especially careful to avoid allowing this product to come into direct contact with your eyes. Be sure to apply this treatment option using a clean cotton swab, or Q-tip, in order to apply the treatment to the base of your lashes only. This treatment option may be prescribed in addition to an oral antibiotic medication. 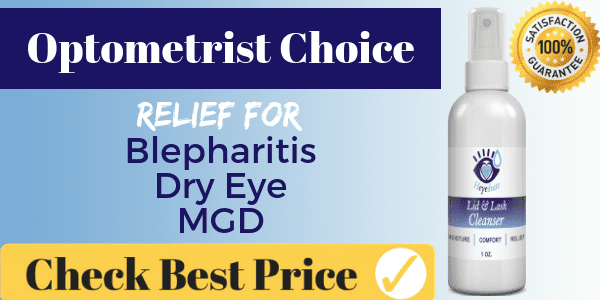 If your anterior blepharitis is caused by an infestation of Demodex mites (seborrheic blepharitis), then you can treat the condition by cleaning your eyelids with solutions that contain tea tree oil. 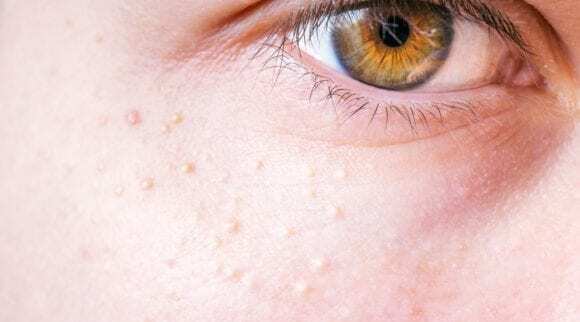 It is especially important to talk to your doctor or eye care specialist before beginning this treatment option as tea tree oil can damage your eyes if it is not applied correctly. Keep it simple and try out the Heyedrate Tea Tree Oil Soap! 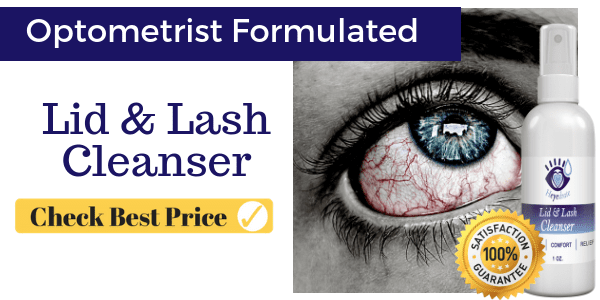 For both anterior and posterior blepharitis, you may be prescribed artificial tears in order to alleviate the symptoms of redness, inflammation, and dry eyes. You could also be prescribed an antibiotic eye drop formula in order to assist in the proper production of oil from your oil glands. Home remedies are another great option for treating blepharitis that is not caused by a bacterial infection. Oftentimes, home treatment is the best first option for treating posterior blepharitis and cases of anterior blepharitis that are not caused by a bacterial infection. Some of these treatment options include implementing an effective skin and eyelid hygiene regime to control your blepharitis symptoms, and the use of eyelid scrubs, eyelid massages, and warm compresses. 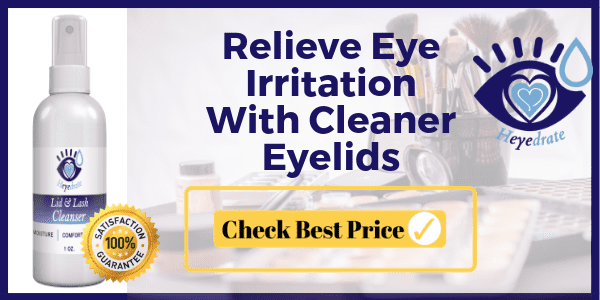 Home treatments are great for maintaining good eyelid hygiene, which can not only relieve blepharitis symptoms, but it can also prevent cases of blepharitis. Consistently cleaning the eyelids helps you to unclog any blocked oil glands, decrease crusting and flaking, and improve some of the symptoms of dry eye syndrome. Keeping your face, eyelids, and hair clean can help with alleviating and preventing the symptoms of posterior blepharitis. A great method for keeping your eyelids and eyelashes clean it to wash the area with a hypochlorous acid eyelid cleanser. This cleanser will not irritate your eyes or skin, and it’s extremely easy to use. If you are currently suffering from blepharitis, then it is also a good idea to wash your hair and eyebrows with a tea tree oil shampoo with antibacterial properties. There are also sprays that can be used to clean and disinfect the eyelid and eyelash area and prevent the growth of bacteria. Taking it a step farther than a general cleaning of the area, you can do an eyelid scrub with a hypochlorous acid cleanser. Eyelid scrubs are a great way to give this often overlooked area a deep cleaning. 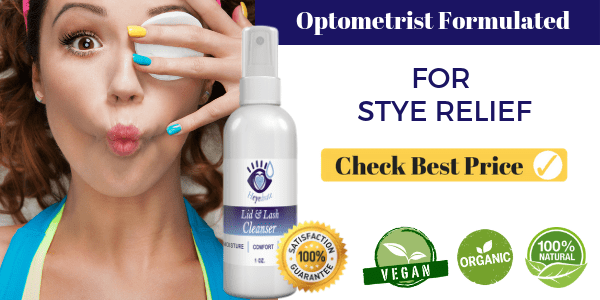 If you wear makeup, then there is likely leftover eye shadow, eye liner, and mascara on the eyelids that can be missed during a quick face wash.
To begin scrubbing your eyelids, simply spray the solution onto your closed eyes and run it in. You can also use a cotton ball or round to apply, but it’s not necessary. Then, simply let it dry. There’s no need to rinse this off! For an even more effective scrub, you can use a soap, foam, or pre-moistened pad that is made specifically for scrubbing the eyelids to clean your eyelashes and eyelids. These products are great for removing the build up of crust that occurs with blepharitis. Be sure to avoid directly touching your eye with any cloth, pad, or cotton swab that you use to clean your eyelids. Transferring bacteria from these areas into your eye can lead to more serious infections. If you are using a cleanser, it may contain chemicals that are harmful if they get inside the eye. The only safe cleansers for getting directly into the eyes are hypochlorous acid cleansers, which should not cause irritation when applied. Applying a warm compress to your eyelids is a great method for alleviating symptoms of posterior blepharitis. In order to use a warm compress as a remedy for the symptoms of blepharitis, you will want to begin by heating a dry eye mask in the microwave for 15-20 seconds. 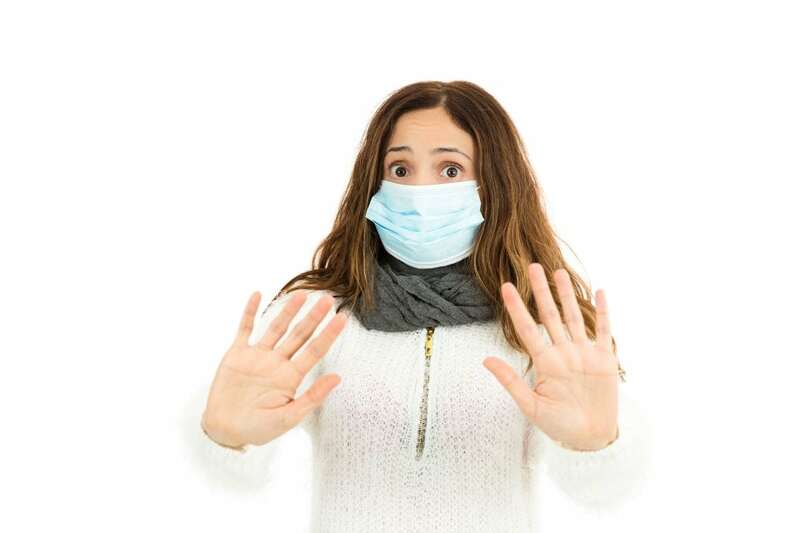 After checking the temperature, close your eyes and place the mask over your eyelids for 10-20 minutes. Warm compresses are great for loosening the crust-like substance that accumulates around the eyelashes, causing them to stick together. A warm compress mask is a great option to treat your blepharitis symptoms. A mask can be warmed in the microwave, as stated earlier, and usually does not need to be reheated as often as a washcloth warmed with water. With a dry eye mask, you should warm it up in the microwave for about 15-20 seconds. Then, you can close your eyes and apply it to your lids for about 10-20 minutes. An eyelid massage is a great follow up to an eyelid scrub or a warm compress. You can give yourself an eyelid massage by using a clean index finger to firmly press your eyelid against your eyeball. For an effective eyelid massage that helps to alleviate your blepharitis symptoms, you should massage for four seconds in four different areas on each upper and lower eyelid. An eyelid massage can cause blurred vision for a few seconds, but it will provide some relief to your blepharitis symptoms. 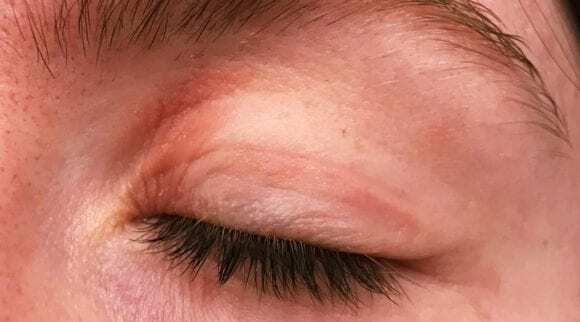 It can be a good idea to perform your eyelid massages with a few drops of castor oil, which is known to provide relief for blepharitis symptoms. Castor oil is included in many treatment options for blepharitis because it is naturally anti-inflammatory. It can treat many of the common causes of blepharitis including inflammation, dryness, and infection. Castor oil is also anti-bacterial and anti-fungal. Adding castor oil to your regular eye hygiene routine can also help to prevent future cases of blepharitis. It is uncommon for blepharitis to cause lasting or ongoing negative effects after proper treatment and implementing improved hygiene practices. However, it is important to note that this condition can lead to or be accompanied by a few other common eye conditions. A stye, also known as a hordeolum, is a painful bump that can develop along the edge of your eyelid. Styes are commonly caused by bacterial infections within a clogged oil gland along the margin of an eyelid. Styes occur when one of your eyelash follicles becomes infected, resulting in a red, sore bump filled with pus. Similar to blepharitis, styes can also cause your eyes to become excessively watery and itchy. You can get a stye on the inside or outside of the eyelid. Styes usually happen in just one eye at a time. If a stye develops on one of your eyes, then it is a great idea to try a home treatment. Warm compresses are a great method for alleviating the pain and soreness of a stye. Be sure to use a fresh cloth with each warm compress in order to prevent the accumulation and distribution of bacteria. If you have a stye that lasts for longer than one week, then you should consult your eye doctor. If a stye is left untreated it can develop into a chalazion. 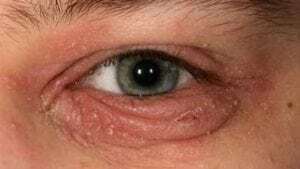 A chalazion, which is medically referred to as conjunctival granuloma, can form when the oil glands along the edge of the eyelid become blocked which leads to enlargement and scarring. You can develop many chalazia on one or both eyelids. Chalazia are similar to styes in that they are bumps that can occur on the eyelid, particularly along the eyelash line. Chalazia and styes are different in that chalazia aren’t red or painful. Luckily, Chalazia can be treated using the same methods that can be used to treat a stye, but they do not usually go away within a week. Chalazia take much longer to heal and can remain on the eyelid for many weeks. Dry eye syndrome is another common condition that is related to blepharitis. It is caused when your eyes do not produce an adequate number of healthy tears. It can also develop when your tears evaporate from the surface of your eye quickly due to a missing lipid, or oily, component within the tear film. Dry eye syndrome causes your eyes to become dried out and inflamed. This can cause gritty and burning sensations within the eyes. The best treatment options for preventing dry eye syndrome include good hygiene and the use of artificial tears. These options are also great for alleviating the symptoms of posterior blepharitis. Blepharitis can also lead to repeated instances of pink eye, or conjunctivitis. 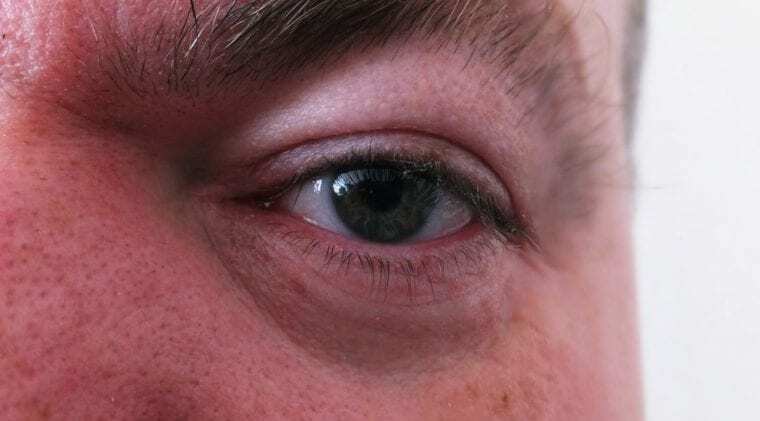 Is blepharitis contagious? . But this condition is contagious. Conjunctivitis is an inflammation of the conjunctiva. This is the transparent membrane that covers the white part of the eyeball and the inner surfaces of the eyelids. Conjunctivitis can occur when bacteria in the eyelid infect the eyes. The condition isn’t usually serious and shouldn’t affect your vision. Antibiotic eye drops may be prescribed if your symptoms continue or if you continue to have repeated infections. Meibomian cysts cause swelling in the inner eyelids. Cysts can form within the Meibomian glands, which are responsible for producing the oily (lipid) component of the tear film when these glands become inflamed due to blepharitis. Meibomian cysts do not usually cause pain. However, they can get infected. An infected Meibomian cyst is more likely to cause pain. If you develop a Meibomian cyst that becomes infested, then you should see a doctor or eye care specialist. You may need antibiotics to treat this infection. You can treat a Meibomian cyst that is not infected through the application of warm compresses. These can reduce swelling and provide relief from irritation. If you have a Meibomian cyst that does not heal within a reasonable time period, then surgery may be required for removal. 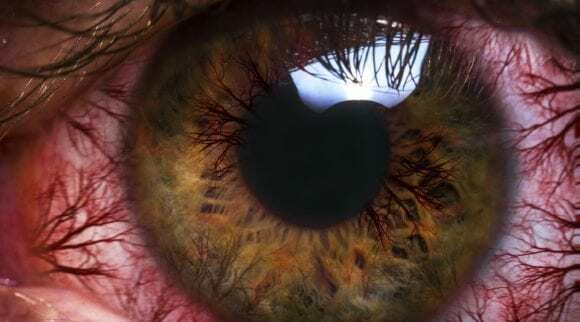 If your eyelids are constantly inflamed due to blepharitis, then you can end up developing conditions that affect the cornea, such as corneal ulceration and keratitis. The cornea is a clear structure that is located in the front area of the eye. Separated by aqueous fluids, the cornea covers the iris (the colored area of the eye) and provides it with a protective barrier from bacteria, germs, and disease. A damaged cornea can have a negative impact on your vision and the overall health of your eyes. Now that you understand the causes, risk factors, symptoms, and treatment options for blepharitis, it is a good idea to learn more about the prevention methods for blepharitis. If you have previously experienced blepharitis, then you will not want to contract its symptoms again. Keeping your hands and face clean. Keeping your hands and face clean will reduce the number of bacteria that builds up around the eyelids and eyes. Many people have bad habits of constantly touching the face and rubbing the eyes. It is a good idea to reduce how often you touch your face, particularly the area around your eyes. If you find this hard to do, then you should be extremely diligent in keeping your hands and face clean. Keeping your eyelashes free from excess tears and other debris. Allowing any substance to build up along your eyelashes can cause blepharitis and other eye conditions. Excess tears can dry up into flakes or crust. These particles can provide a space for bacteria to attach and accumulate. Other debris such as eye makeup and leftover eye drops can also carry bacteria, mites, and allergens that can cause blepharitis. Using clean and sanitary makeup applicators and products. Contaminated makeup products are a major cause of bacterial blepharitis. Makeup products and brushes can carry a lot of bacteria if they are not properly and regularly cleaned. Although blepharitis is not contagious, you should avoid sharing liquid eye makeup products and eye makeup applicators in order to prevent the spread of germs that can cause blepharitis. If you have had blepharitis in the past, then be sure to throw out any mascaras, eyeliners, or other liquid makeup products that may have gotten contaminated by bacteria, allergens, and mites. It is best to avoid using eye makeup while you are treating blepharitis. Properly inserting and removing your contact lenses. Contact lenses can carry a lot of germs. It is important to follow the proper methods for inserting and removing your contact lenses in order to avoid blepharitis and other eye conditions. Make sure your hands are clean anytime you handle your contact lenses. Be sure to disinfect your lenses and store them properly using a clean case and fresh solution. You should also be sure to remove your contact lenses as directed. For example, if you wear daily contact lenses, then be sure to remove them each night. Prolonged wearing of contact lenses prevents your eyes from receiving enough oxygen, which increases your risk for the accumulation of germs which can cause blepharitis and eye infections. Blinking more often. If you commonly work at a computer or read then you may be keeping your eyes open longer in order to concentrate on the screen or page. This can cause your eyes to dry out, and blinking helps in keeping your eyes sufficiently moist. Blinking also allows your meibomian glands to release more oil, which provides a layer of protection for the surface of the eyes. While blepharitis is not contagious, it is still uncomfortable and something you want to get rid of as soon as possible. Inflammation of the eyelids, medically referred to as blepharitis, is a condition that can be caused by bacteria, allergens, and mites. This inflammation can lead to many uncomfortable symptoms such as redness, irritation, and a crusting of the eyelids. Although some cases of blepharitis can cause blurred vision, this condition is easy to treat and does not usually cause any negative lasting impacts on your overall eyesight. It is important to recognize the early signs of blepharitis in order to avoid the likelihood that this condition will lead to other more serious eye conditions such as styes, chalazia, chronic pink eye, dry eye syndrome, Meibomian cysts, corneal ulceration, and keratitis. Luckily, these complications can be avoided by practicing proper eye care and hygiene. If you notice any signs of blepharitis or other eye conditions, please visit your doctor or eye care specialist for a proper diagnosis and treatment options.